About six hours in a cramped van brought us from Sabang to El Nido at the north end of Palawan Island. El Nido is a bit off the beaten track but it is well worth the effort to visit. It is a tropical paradise! We rolled into town without reservations so while Amy watched our bags, Charles and I scouted out the accommodation options. The beach front was lined with a dozen or more guesthouses right up against one another. We had read in the guidebook that there were some more secluded alternatives just outside of town around the point. Makulay Lodge was the first place we found and we absolutely loved it. The guesthouse was small operation. There were only three rooms in the original building where Amy and I stayed and we were lucky enough to get the top-floor room with a stunning view of El Nido’s bay. We negotiated a 1000PHP ($23) nightly rate for the room. Certainly one of the best room values of our RTW trip. The main thing to do around El Nido is to tour the surrounding waterways and islands. Day-long boat tours are how this is done and the staff at Makulay helped us hire a boat on three separate days. On each of these tours, lunch consisted of the boat crew grilling up some fresh fish on the beach. Charles joined us on the first two tours and we were lucky to have a private boat just for the three of us. The boat tours averaged 600PHP ($14) per day per person. I also enjoyed some of the area’s superb SCUBA diving during our stay in El Nido. I dove with Palawan Divers, one of the older outfitters in El Nido, for an affordable $65/day for three dives. Amy was also able to join the tours for a nominal fee to go snorkeling. We didn’t have an underwater camera with us this time around but we saw some spectacular sea life. The highlight for me was seeing a massive sea turtle at close range. Given how cheap it is to reach Palawan I was shocked that there weren’t more tourists in El Nido. Everyone kept telling us that high season was right around the corner (Nov 1, to be exact) but we saw little sign of tourist hordes. I’ve spent a fair amount of time exploring SE Asia’s beach and island offerings over the past few years and I have to say that El Nido is one of the most idyllic tropical destinations I’ve seen. We liked it so much that we stayed a week in total soaking up the tropics. A nice lightshow one evening. The fruit-eating bats would always leave presents on our porch overnight. You definitely don’t want to fall on these. When we returned to civilization after our 13-day Mongolia tour, I was happy to hear that my friend Charles would be making a short-notice trip over to SE Asia and that his plans overlapped with ours in the Philippines. Charles is a fellow frequent flyer mile junkie and has completed two impressive round-the-world trips on his own. Neither of us had been to the Philippines before but we had all heard good things about Palawan. For the most part, getting around the Philippines is cheap and easy thanks to a very competitive mix of low-cost carriers. We used one of the biggies, Cebu Pacific, to travel from Manila to the island of Palawan. Palawan is in the far southwestern corner of the Philippines and is one of the country’s least developed areas. The tickets rang up at an affordable $56 per person. After a brief overnight in the town of Puerto Princesa, we boarded a bus for Sabang, a tiny village on the west coast of Palawan. The ride took us across mountains, rice patties and small farms – every once in a while we’d catch a glimpse of the beautiful coastline. The main attraction in Sabang is the “Underground River.” The Underground River is a long water-filled cave which is navigable in small canoes and kayaks. The tourism board recently completely a successful campaign to have it listed as one of the “New 7 Wonders of Nature” against competition such as Iguazu Falls and the Galapagos Islands. I can’t say that I would rank it as such but it was an interesting and impressive sight. As a tip to other travels, make sure that you are up early to catch one of the first boats into the caves as it can get very crowded and noisy with all the other tour groups. To me, the real beauty of Sabang is how sleepy it is. The wide crescent-shaped beach isn’t bad either! Most tourists visit the Underground River by way of a day tour from Puerto Princesa and while the beach is bustling by day, it is almost deserted in the late afternoons and evenings. Sabang offered up the whole range of accommodation options. At the low end were small bamboo huts and at the high end were two out-of-place and nearly empty high-end resorts. While Amy stayed with the backpacks, Charles and I scrutinized the options. At the far end of the beach we found a humble little place called Mary’s Beach Resort. Mary’s only had about 5 bamboo huts and two of them had prime location facing the beach. We stayed in the hut on the right for three nights. 600PHP ($13.82) per night! One of Continental Airline’s more obscure routes took us from Palau to Manila. We spent a couple of nights in Manila but honestly we didn’t see much more than a few shopping malls. The city really doesn’t have all that much to offer the tourist so I don’t think we missed much. Maybe we should have tried harder? We had a few days to kill before Charles, a good friend of mine, arrived in Manila. We had heard some decent things about Taal Lake which lies a couple hours south of Manila so we headed that way. Like most of its neighbors, the Philippines has a creative and entertaining solution to mass transit: the jeepney. Jeepneys used to be surplus military jeeps that were extended and converted into bus-like vehicles. These days, jeepneys are made locally from scratch but still keep the styling of the originals. What’s cool about the jeepney is that it comes in all shapes, sizes and colors – it is as if there are no two that are the same. The only commonality amongst jeepneys is that they tend to be severely overloaded with passengers and cargo at all times! During our three weeks in the Philippines we saw and made use of many jeepneys. My friend Charles amassed a sizable collection of jeepney photos and those are featured in the album. To ride a jeepney you just flag it down (they will stop anywhere), climb in the back and hopefully find some space on one of the benches. Next you yell your destination at the driver and pass forward the correct fare (the other passengers help to pass it forward). If you don’t have exact change then the driver will count out change all while driving, shifting and honking. Cheap transport but not comfortable transport. Fortunately, Taal lake is quite close to Manila. We spent about an hour on a bus and then a further hour on a jeepney to get to Talisay on the north side of the lake. Talisay is perched on a ridge overlooking the lake and, thanks to the altitude, has a mild climate compared to Manila. The entire Taal lake area is part of the Taal volcano, one of the most active in the Philippines. There are numerous craters visible from the ridge. The most popular excursion is to take a boat to volcano island, hike up to the ridge and get a look at the boiling sulfurous lake below. We took a boat out to the volcano one day and hiked to the ridge. Sadly, most tourists make the trip by horse and they all looked to be pretty sickly and overworked. The climb wasn’t all that bad but we were glad we started early in the day when temps were lower. The view from the top was good but I think we are starting to get a bit spoiled by all the fantastic landscapes we’ve seen on the trip. Food-wise, the Philippines didn’t impress us. It is a bit of a paradox because they certainly have access to the same ingredients as their neighbors. Most of the food that is available sort of reminded me of carnival food – fried chicken, hamburgers, cotton candy, deep fried ice cream, etc. To be fair, I did have some very good chicken adobo (a Filipino national dish of sorts) but there wasn’t the variety of cuisine you see elsewhere in SE Asia. Despite the Philippines shortcomings on the food front, we did have a few entertaining culinary experiences. The first came when we were on the bus down to Talisay. Food vendors came on board the bus to sell their goods. This is common throughout the world but what was interesting here is that it is done by the big corporate food outlets. We had a guy in a Dunkin Donuts polo shirt hocking big boxes of donuts! I was in the mood for lunch so I got a mini pizza. The other thing the Philippines does right is cold beer. A bottle of respectable pilsner for under a buck is universally available. Perfect after a long day of diving! Is he filling it with water or petrol? Note the hose running to the engine. Does it have a steam engine? Our boat was partially made of discarded circuit boards! The Philippines may come up a bit short in the area of cuisine but they do deliver on cheap cold beer. Sample Mexican food outside of the America’s is a big risk but Army Namy in the Philippines did a good job. They even put a funny stamp on your receipt after you get your food. Run by an ex-pat, I assume. Readers who have been watching the map on the website have probably noticed that we are no longer in Sri Lanka. Indeed, we left the Pearl of the Indian Ocean a little over a week ago. After almost 25 days of frequent use of Sri Lanka’s public transportation, coach seats on a Bangkok-bound airplane felt absolutely luxurious! I still have quite a bit more to write about Sri Lanka but I thought I would interrupt the normally scheduled broadcasts and share our upcoming adventures. During our last week in Sri Lanka I spent some quality time looking at airline award charts. Ever since we left the States in July, I have been carrying hard copies of redemption charts for United, America, British Airways, British Midlands, and US Airways – all airlines in which I have a fair number of miles sitting in the bank. I am sure I really confuse other travelers and locals alike when I sit someplace public and pour over these tables but staring at them for a long time is the best way for me to find the fun corner cases. While planning our escape from Sri Lanka I think I had some good luck finding one of those corner cases. The first idea I had was to cash out some British Airways miles for an award with Cathay Pacific. This would take us from Sri Lanka to Thailand for a stopover then onward to Hong Kong for another stopover. Finally, the award would terminate by carrying us from Hong Kong to either Manilla or Cebu in the Philippines. This seemed to be a good value but I wanted to stretch it even more. Mongolia has long been on my must-see list and we are in the same neck of the woods, sort of. OneWorld has no service to Ulaanbaatar but Air China, a Star Alliance member, has once daily service from Beijing. Nesting a second award ticket inside of our Hong Kong stopover was doable but the miles required wasn’t all that attractive and the Chinese visa issues even less so. Eventually it occurred to me that I could probably accomplish most of our goals with a single ticket using my British Midland (BMI) miles. BMI allows stopovers, even on one-way awards, and prices their awards with a zone-based system which favorable groups all those destinations into adjacent zones. By booking two one-way reservations I was able to construct a ticket to take us from Sri Lanka to Thailand for a stopover and then onward to Ulaanbaatar. After a 16-day stay from Ulaanbaatar a second one-way ticket will take us from Mongolia to the Philippines…but wait, there’s more! While I was checking the Star Alliance timetables for Manilla, I noticed that Continental’s Micronesia division has twice-weekly service from Manilla to Palau. I also noticed that Asiana has four-times-weekly service from Seoul to Palau. I wasn’t sure if the airline would accept the detour through Palau but I was determined to give it a shot. After checking award seat availability I phoned up BMI and read off the segments. The agent commented on the long routing but also noted that routing through Singapore, a much longer distance, was legal. He had to get a supervisor involved but eventually all was approved. 15,000 miles were used for the entire ticket: Sri Lanka to Thailand to Mongolia to Palau to the Philippines. My good friend Charles opined that we will perhaps be the 55th and 56th people ever to fly from Mongolia to Palau. It is certainly a strange routing and a testament to the power and flexibility of air miles and global airline alliances. Even if we aren’t the 55th and 56th, travel that day should be a radical change of scene after 16 days out on the steppe! 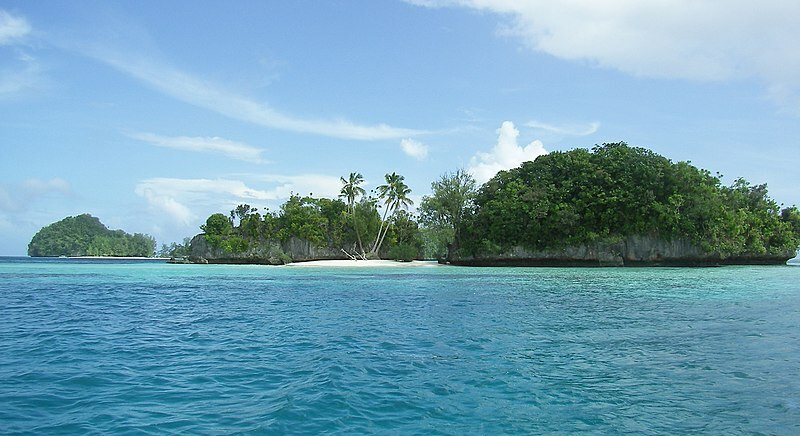 So in the end we didn’t accomplish the goal of visiting Hong Kong but we did add the bonus destination of Palau! Hong Kong should be easy enough to hit up some other time as its a major hub. Our stop in Thailand is scheduled to last 12 days; not enough time for Laos but certainly enough time to visit the ruins of Angkor Wat in Cambodia. We could have stopped longer but the Mongolian winter is closing in. Even this week, the second full week in September, they are already seeing lows around 15F (-10C)! It’s high time to shop for some cold weather clothing!